Ok, ok, I get it! You’ve seen the Scentsy Diffusers, and they look amazing and all – but you are genuinely curious as to what makes them value for money, right? I was exactly the same way. That was before I experienced a Scentsy Diffuser up close and personal. I even went so far as to question just how excited my Scentsy customers would really be about this new product line back in September 2015. I was very Scentsy warmers and wax loyal. Although I knew I would love anything Scentsy brought to the fragrance table- it was far from an instant love affair. Experiencing my first Scentsy Diffuser is what quite literally caused me to reimagine home fragrance. Now it’s your turn! Scroll on down to discover the 7 reasons you need a Scentsy Diffuser. Perfect for your home, your workplace; your life! As soon as the misty plume of microscopic mist and fragrance starts, the ooh’s and ahh’s follow. The stunning, hand crafted Scentsy diffuser shades create an opulent and elegant feel. That’s before the light features even come into play! Most people agree they were sold on their Scentsy Diffuser right from the graceful world-class design. The Scentsy Diffuser is the most advanced diffuser on the market. The Scentsy Diffuser is both an ultrasonic and nebulising unit. Essentially, there is a small ceramic disk in the water reservoir – called a nebuliser. This disk vibrates at high frequency to break the water and oil down into fine microscopic particles. This micro mist is then dispersed into the air. The capability to control exactly what is creating the fragrance in the spaces you and your family spend your time in can be paramount for many Scentsy customers. 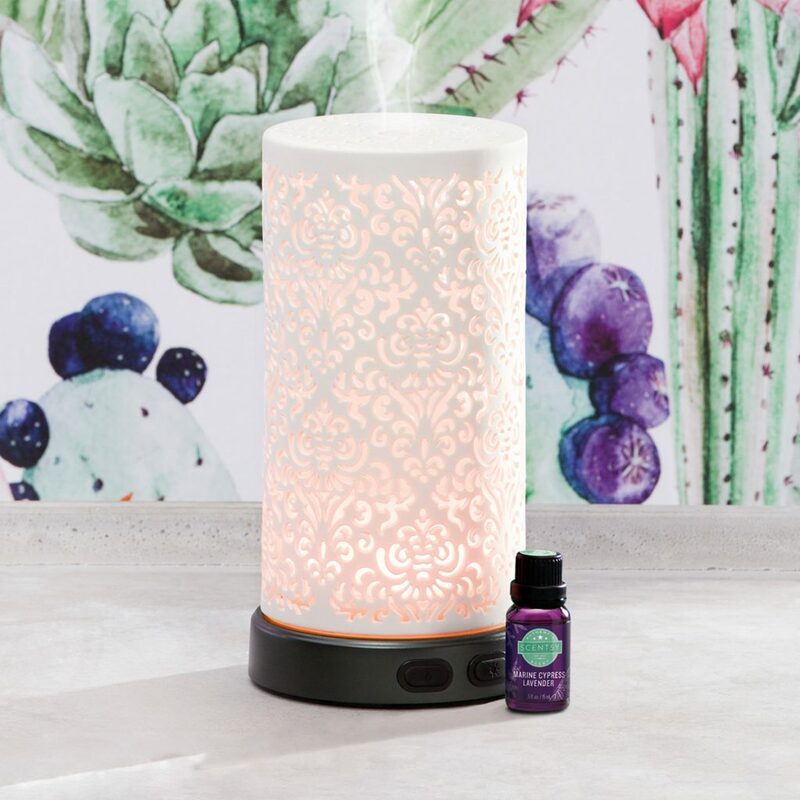 The Scentsy Diffuser allows customers to have the fragrance experience Scentsy are renowned for, and complete peace of mind at the same time. There is no need to add distilled water to your Scentsy Diffuser. Simply add tap water to the reservoir fill line (about 120 mL). Then add your desired Essential Oil or Natural Oil. I recommend starting with 4-5 drops of oil. Then add more or less to suit your personal preference and the size of your space. The mist is cool. Literally! This is thanks to the cold mist technology and lack of heating element. The Scentsy diffuser shuts off when the water reservoir is empty, or if you have overfilled the reservoir. This means that you are virtually bullet proof when it comes to the correct usage of your diffuser. Scentsy diffusers come with a warranty against defects in material and workmanship for the lifetime of the product. This means that your first diffuser purchase can literally be your last if you so desire. You can relax knowing that the investment that you have made in a world class product will stand the test of time. Should you ever have an issue with your Scentsy diffuser; for example it is found to be defective or damaged under normal use and care- your diffuser will be replaced with the same, or comparable, product (at Scentsy’s discretion). Scentsy’s lifetime diffuser warranty is undoubtedly the most generous warranty on the market. In fact Scentsy encourage consumers to research and compare! 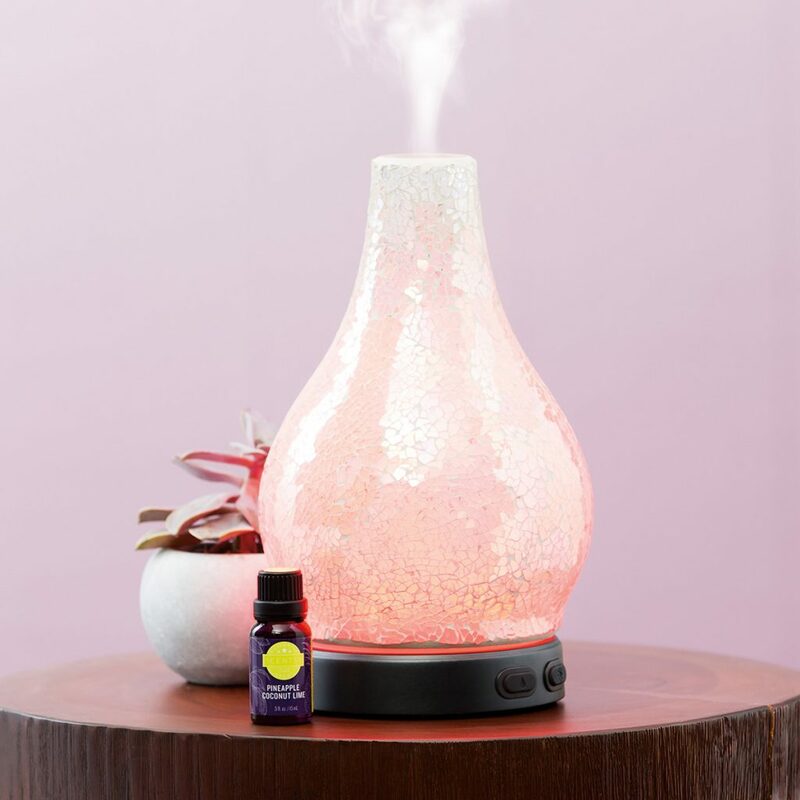 It is also important to note that if you have your own preference or stash of existing aromatherapy oil products you are able to use these essential oils in your Scentsy Diffuser. Though Scentsy Oils have been specifically formulated for an optimal fragrance experience, using other companies’ oils will not harm the Scentsy Diffuser or void the warranty. Scentsy diffusers aren’t only creating sensational fragrance with that stunning cool mist. When the microscopic particles of water and oil disperse into the air via that mist they also serve another purpose. The teeny tiny particles bind to the dust molecules, pollen and even airborne bacteria and draw them down to the ground where we are less likely to breathe them in. Who wouldn’t want to combine home fragrance with the ability to purify and essentially deodorise the air we breathe in? Having a cleaner home environment or workplace can serve to help with allergies, hay-fever, respiratory issues, and asthma sufferers. It makes perfect scents! Have you ever noticed that you feel more refreshed near the ocean, a waterfall or even taking a shower? That sensation comes down to the fact that these areas have a higher concentration of negative ions to positive ones. Negative ions = positive feeling. There’s science behind this effect. The force or energy of falling or splashing water causes splitting of neutral particles of air. This frees electrons which attach to other air molecules causing a negative charge. Negative ions are known to improve well-being. Negative ions communicate with serotonin in the brain. This results in lower stress and anxiety, fewer headaches, and less fatigue. The amount of control you have over your custom fragrance experience using your Scentsy Diffuser can be quite exciting. Firstly, because the diffuser uses cold-mist technology, the fragrance character remains consistent throughout the fragrance experience. Secondly, the diffuser offers high, low and intermittent diffuser modes. This gives you more control over the intensity and longevity of your fragrance experience. Thirdly, you can customise your fragrance experience by adding more or less oil, or combining oils. I will admit, it speaks to my inner child mixing up my own Scentsy magic spells to fragrance my living areas! Your Scentsy Diffuser offers 16 different light modes, allowing you to change your lighting to complement your décor or mood. My eldest son loves to choose the colour his diffuser is set to overnight in his bedroom. Or, you can turn the light off completely whilst the mist is in operation if you prefer. Whereas my daughter sneaks past and changes my light setting from the rainbow spectrum of colours to her personal favourite… pink! The light and the mist working independently from each other makes your Scentsy Diffuser a perfect night light. Even when the diffuser uses all the water and automatically shuts off- the reassuring light remains. Scentsy Diffusers use the world’s most advanced ultrasonic nebuliser to disperse fragrance. They offer a limited lifetime warranty. They look amazing AND and feature 16 LED light options. The most features, the most advanced technology and the most attractive diffusers on the market? The choice is Scentsy simple! Like what you have read? Share the love by sharing this article. Want to connect with me? Venture back to the top of the page and find me social media style or hit the contact tab on the main Scents With Christie site.